Essence of the sea , the essence of the earth, both impregnated with the Mediterranean and within the most current aesthetic trends, this is what this collection of works-object offers us as a product of this joint commitment of two artists, the photographer Fina Lunes and the ceramist Eulàlia Oliver. Arranged to take us by unusual paths, to play with the senses, with equal and different sensibilities at the same time, from forms of creation as diverse as ceramics and photography, the collaboration of these two artists, a mixture of their extensive professional careers, They have created this collection of works-objects that offer us a subtle and elegant combination of image, color, shape and texture. Starting from the personal work of each artist, «The plat» porcelains by Eulàlia Oliver and «Caracolas» photographs by Fina Lunes, they have created a collection of delicate pieces, plates and cups, which on the basis of functional elements give rise to works-object fundamentally decorative. The collection was presented at the International Week of Gift, Jewelery and Jewelry/Intergift, held in Madrid. Published in ON Diseño, architecture and design magazine. Num 238. p. 83. September 2008. The collection «From the land and the sea», is the product of a common bet, by the photographer Fina Lunes and the ceramist Eulàlia Oliver. 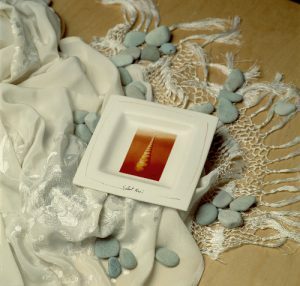 Starting from the personal work of each artist, «The plat» porcelains by Eulalia Oliver and «Caracolas», photographs by Fina Lunes, have created a collection of delicate pieces, plates and coasters that on the basis of functional elements give rise to works- fundamentally decorative object. For the fusion of the image and the material serigraphic procedures have been used. 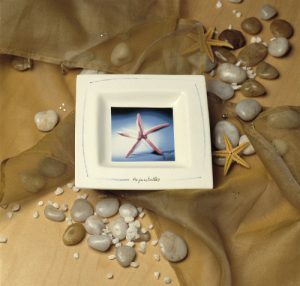 It combines the creation of unique works with the realization of serial work, being the porcelain series “the plat” the base of this collection. Published in GOLF International Magazine. It is the suggestive name that hides the project in which two brave artists have embarked: the ceramist Eulàlia Oliver and y the photographer Fina Lunes. Each artist has taken as his starting point his personal work. «The plat», Oliver’s porcelain and «Caracolas» photographs from Lunes, finally creating a collection of delicate pieces, plates and cups that give rise to works-objects. The risk, the adventure, is what attracted Fina Lunes from the beginning, a Catalan photographer who starts from fashion photography and portraiture, a work she does not abandon. This is rather an exploration of other paths, from where the graphic work starts, an incursion through different ways, because in art everything has to be intermingled, and within the personal research of Fina Lunes there is a big fan, in which this project, “Of the land and the sea…” has a place. At the end of the day both artists intend with this work to say the same things in parallel ways. Light and color, form, even poetry, are elements shared by Fina Lunes and Eulàlia Oliver. Common notes that are fundamental when it comes to understanding this artistic commitment, a job that should not go unnoticed by its beauty and its courage. Published in VISUAL, Design Magazine, graphic creativity and communication.. Num 102, Year XV.